When creating your PCB, understanding how different vias impact the design and manufacturing process is critical. Oftentimes, issues are introduced during the design phase and aren't caught until after the board has already been sent to production. 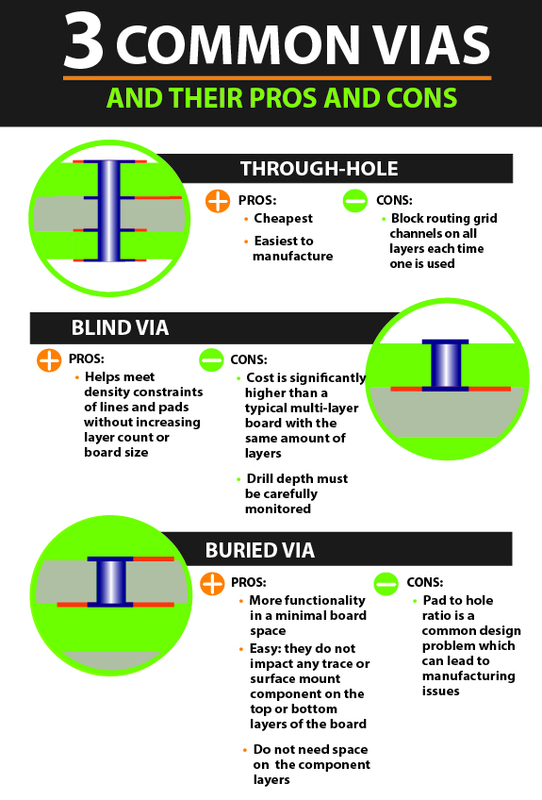 We've created the infographic below to highlight the pros and cons of using specific vias, so you can understand the complications that could potentially arise before, during, or after manufacturing. Potential manufacturing problems such as pad-to-hole ratio and drill depth are important to identify early, especially if you want to save time and money. And when these issues become larger and more technically challenging, you'll need software to scale with you so you can grow with the ever-changing design requirements. This is where OrCAD PCB Editor can help. Not only is this a fully-scalable PCB design technology, but it also features intelligent place and route, constraint management, E-CAD/MCAD co-design, and more. OrCAD PCB Editor allows you to identify potential design complications before delivering your product to the manufacturer. To learn more about OrCAD PCB Editor, click here.